"A complex world, a compelling plot and a claustrophobic setting." Amy had a choice. After her mother was cryogenically frozen, her father told her that she could choose not to go with her parents on their three hundred year journey to a new planet. She could have stayed with her aunt and uncle, kept seeing her boyfriend, finished school, lived her life. But she decided to give it all up to stay with her parents. That's what makes it doubly horrible when she gets woken up early, while the ship is still in transit. The reader shares her sense of claustrophobia, her longing for a real sky. Part love story, part dystopian nightmare, part murder mystery, ACROSS THE UNIVERSE takes place in the closed environment of the ship Godspeed, where history has been twisted or forgotten, and a new leader, Elder, is being groomed to take on the tyrannical ways of Eldest, a manipulative leader who has turned most of the people into mindless workers. Amy awakens in the middle of this, as the only one aboard who remembers Earth, the only one who remembers what it really means to be human. Can she convince Elder that Eldest's misuse of power is degrading and wrong? Can she uncover the mystery of who woke her, and who is killing other members of the cryogenically frozen planetary landing party? She's going to have to, if she hopes to survive. The point of view switches deftly between Amy and Elder, filling in information gaps and adding depth to an already complex story. A whole tier of secondary characters are also well-developed. While the ending does tie up the salient plot points, at first I thought it was a little abrupt -- until I found out that this is the first book in a trilogy. I already can't wait for the next one. 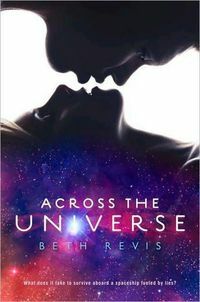 Write faster, Beth Revis!